THE BOOK: Fixing Boo Boo. THE PUBLISHER: Southern Yellow Pine Publishing. SUMMARY: Do you know a person with a brain injury? Pat did. Her sister, Barb, needed help and Pat wanted to help. THE BACK STORY: I started writing it as a cathartic process after my sister died. Since I kept all emails and other correspondence to the many people we had to contact for her care, that became my starting point. Rather than dump all the info gained, I thought it might help someone else facing a similar situation. This being my first novel length work, took me four years to complete, mainly due to running it through a critique group, that only met monthly. WHY THIS TITLE? : My sister had a lot of medical problems, so my husband nicknamed her “Boo Boo” as an endearment. When she came to live with us, she needed surgery on her hip, but that required other things to be taken care of first, hence the “Fixing” part of the title. WHY WOULD SOMEONE WANT TO READ IT? While it certainly will have a niche with families of brain injured people, it may have a broader appeal due to its snarky sense of humor which was necessary for both my husband and I to develop. It also has a nifty resources section for several organizations representative of the main character’s other health problems. I initially bought this book because I wanted to support my friend Pat, the author, but as I began to read this beautifully unfolding story of her sister, Barb, I couldn’t put it down. It is written with humor and honesty and so descriptively that I felt like I was right there with Pat and her husband Gary. I was sad when the book came to an end, I wanted to keep reading! Pat very thoughtfully included a list of resources at the end of the book for people that may be dealing with the same issues. I am proud to give this book 5 stars. Fixing Boo Boo is an incredible story of a woman’s devotion in caring for her brain injured sister at the end of her sister’s life. If you have ever been a caregiver this book will encourage you to keep moving forward. Pat and her husband are determined to give Barb the best care while trying to set boundaries within their own lives. You will find yourself laughing and crying through this journey. You will not want to put this book down. 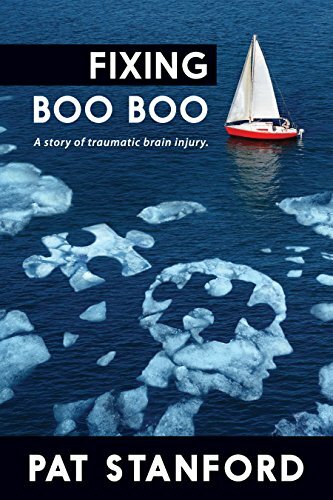 Fixing Boo Boo is heartwarming, informative, and funny from a sister who chose to be a caregiver not knowing what she didn’t know about brain injury. It’s the story of 9,000 families every year in Florida who give up their lives to care for their loved one. Fixing Boo Boo provides a great perspective! Many caregivers will relate to it and just as important, it will invoke thought about disability sensitivity from others that have not been touched by disability…yet. AUTHOR PROFILE: Pat Stanford was born in Philadelphia, PA. Her farming family moved to Delray Beach, Florida when Pat was one, looking for year-round growing seasons. She lived there until a brief stint in the Air Force took her to California. She graduated Florida State University with a B.S.in Secondary Education, which was never used for its intended purpose. She has poetry published in several anthologies, and won second place in the 2004 Seven Hills Contest with her short story, Divorce Sale. She has completed her novel, Fixing Boo Boo, a fictionalized account of what happens when a brain-injured sibling comes to live with a sister who doesn’t know what that means. After being introduced to growing roses by her father, Pat created her own rose garden of photogenic roses. She served as President of the local rose society and is a bronze medal recipient with the American Rose Society. Pat lives in Tallahassee, Florida with her husband and two cats and is currently working on a new novel as well as ghostwriting a book of non-fiction. AUTHOR COMMENTS: It is a story of a family trying to help a brain injured person and not knowing what they don’t know, or what they are getting into. It is unique because it is my story, but it is universal in that many people who don’t understand brain injury may become aware. PRICE: Print -$15.95 Kindle – $4.99.